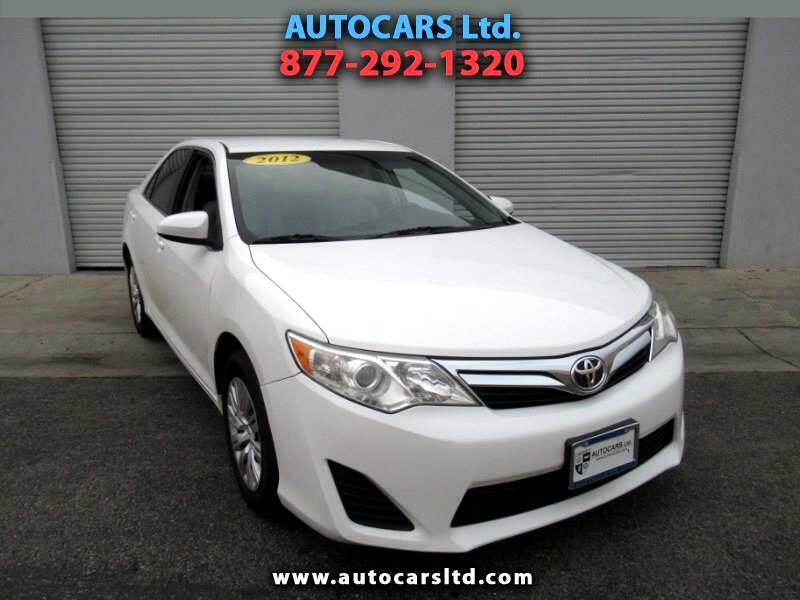 Used 2012 Toyota Camry LE for Sale in La Puente CA 91744 AUTOCARS Ltd.
$189.00 a Month On Approved Credit. Click "Apply Online" on our HomePage. All Credit Welcome. Clean TITLE, Clean CARFAX, NO Accidents *** 2012 TOYOTA CAMRY LE *** AUTOMATIC *** CRUISE CONTROL *** POWER EVERYTHING *** VERY SHARP and CLEAN with ACTUAL MILES *** Comes with 16 SERVICE HISTORY RECORDS *** A MUST SEE *** We have EASY FINANCING and Welcome ALL KINDS of CREDIT *** Multi-Point INSPECTION PERFORMED On Every Vehicle *** (We Pay Top Dollar for your Car, With or Without Trade-In) *** ALL OF OUR CARS ARE ALWAYS PRICED RIGHT IN A HASSLE-FREE ENVIRONMENT *** (PLEASE CLICK and LOOK AT OUR PHOTOS, THEY SPEAK FOR THEMSELVES) *** Please give us the chance to Earn your Business *** Call Us today, we'll make it easy ! All Internet Prices are based on Cash or On Approved Credit only. Not All Buyers Will Qualify. Visit our website: www.autocarsltd.com by clicking on the link for more information. Call us for a test drive or with any questions. CREDIT UNION MEMBERS and NON-MEMBERS WELCOME. Interest Rates on Select Vehicles starting at 0% Brand-New and 2.9% Used. Monthly Payments shown are estimates only and are based on up to 30% down payment on approved credit. Special Internet Pricing expires on 4/19/19. Sold as equipped. All New Cars arranged for sale are subject to price and availability from the selling franchised new car dealer. WE ARE HIRING PLEASANT EXPERIENCED SALES and FINANCE PROS. If You Have What it Takes, Call Us, We'll Talk. All Vehicles are subject to prior sale. We strive for accuracy, but pricing information may be different from actual dealer price, on approved credit. Please check dealer for actual pricing and availability. Not responsible for typographical errors.